I feel like I have become a royal chef for this one moment. It’s time for a great celebration, because Princess Grega got engaged. There are guests everywhere and they are hungry for my specialties. I see them with empty stomach, but we are still waiting for the queen. At least I have time to prepare the surprise of the evening, honestly hidden beneath the lid on each table. Enjoy your meal! 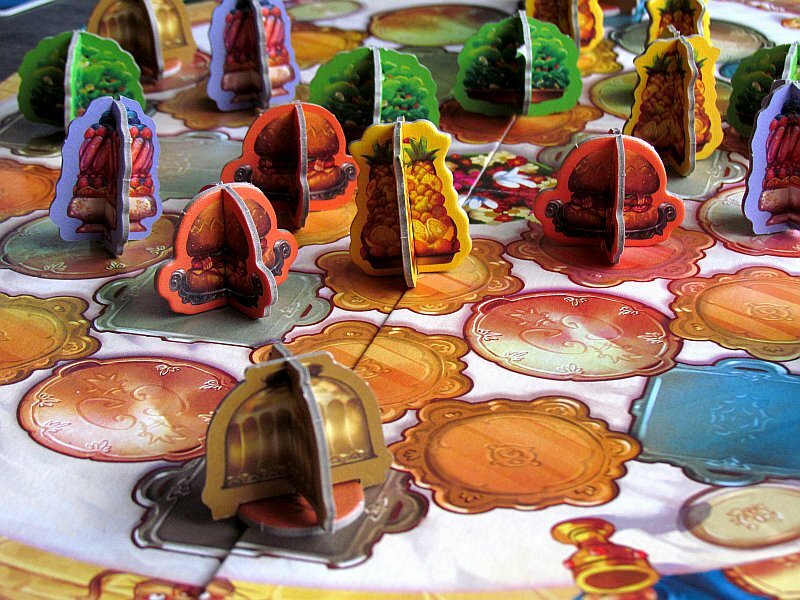 Designer Alain Rivollet, who created new board game Banquet Royal, invites us to the royal feast and tables, that are bent. 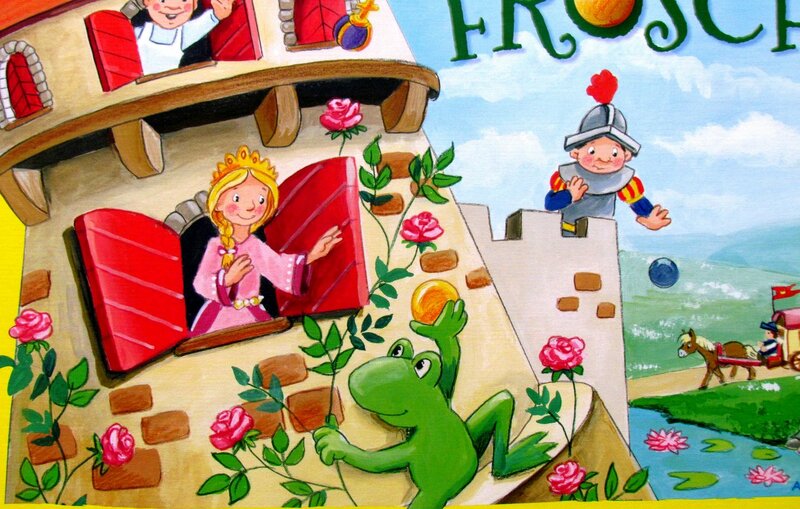 Its illustrations were entrusted to Vincent Joubert, and Bankiiz Editions took charge of the distribution. 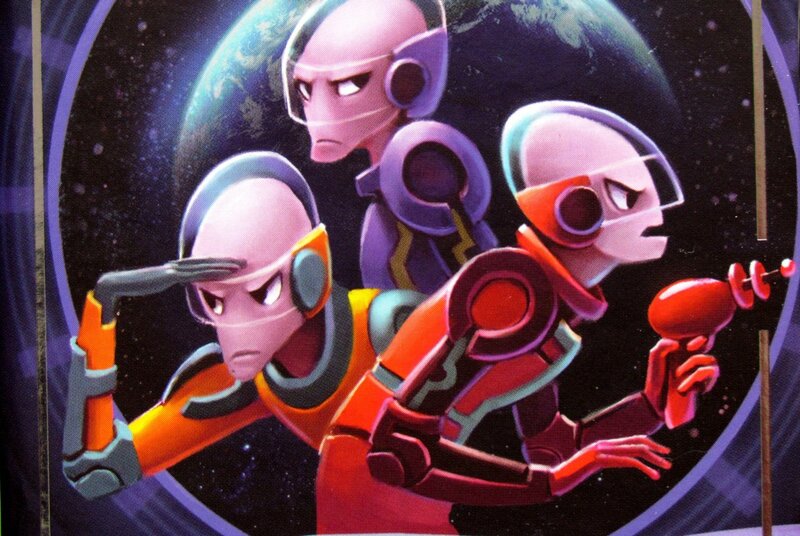 The whole production in the final version was released in 2017. On the lid we can see excited family – king, the queen and their descendants – sitting in front of the flood of goodies and not knowing, what to eat first. 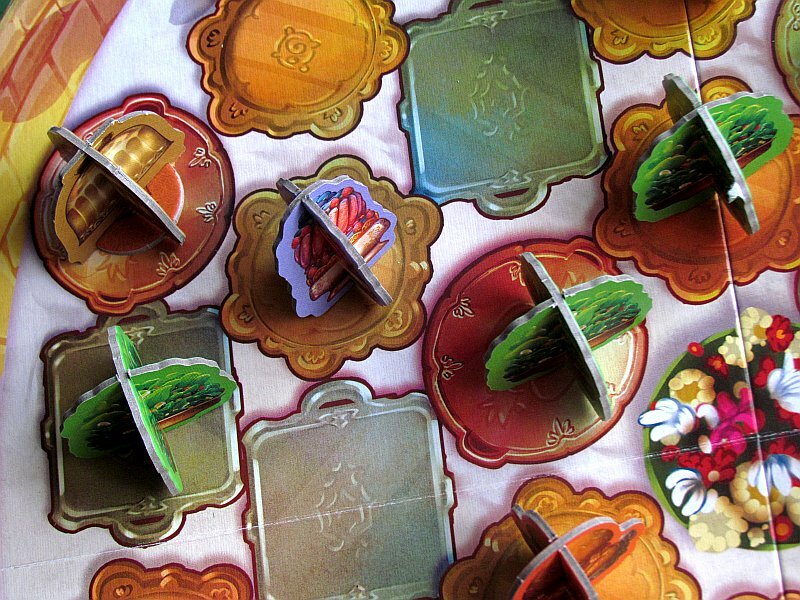 Inside, there is a rectangular game board with a huge royal table full of shimmering – but still empty – trays. There is one of the four members of the family in every corner of the board, faithful dog helping the youngest prince. 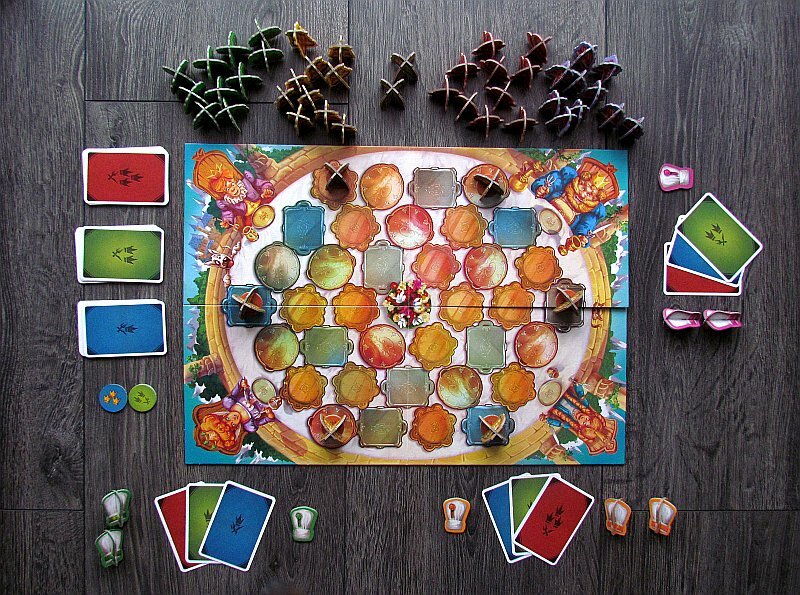 At the beginning of the game, players are next to the table, spreading out all the cardboard pieces of food, hatches and royal orders. That’s the kitchen. You must also put three decks of menu cards on the side. 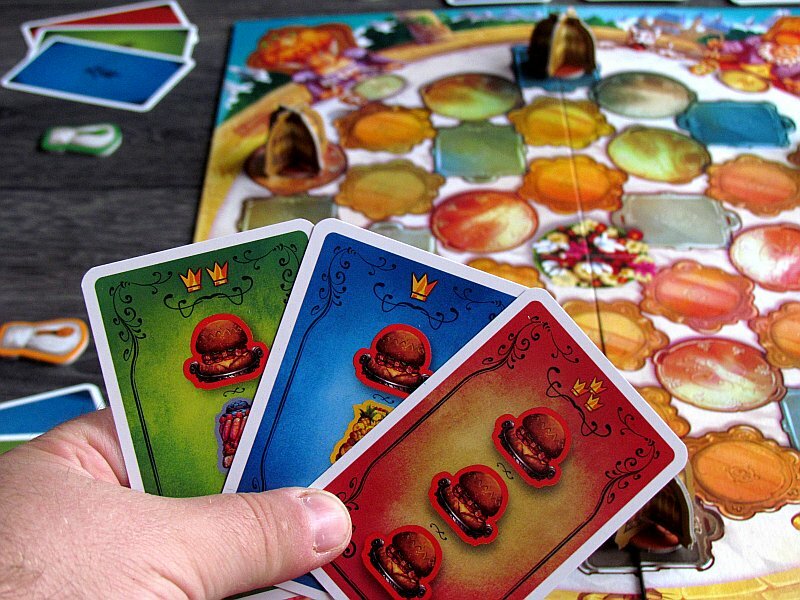 Players each choose their color and receive a three of the chef’s caps and put them in front of them. They will also receive one order card from each available pile. 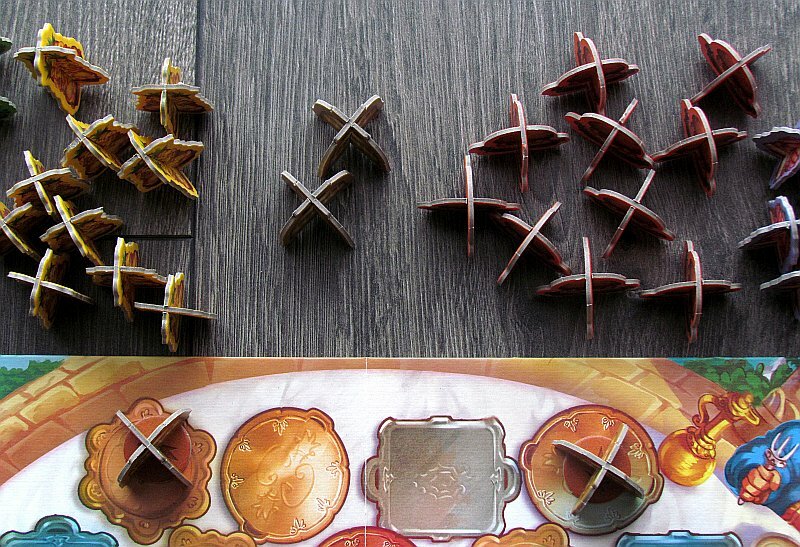 Only before the game starts, they spread six random tiles on the table with royal orders covered by the lid. 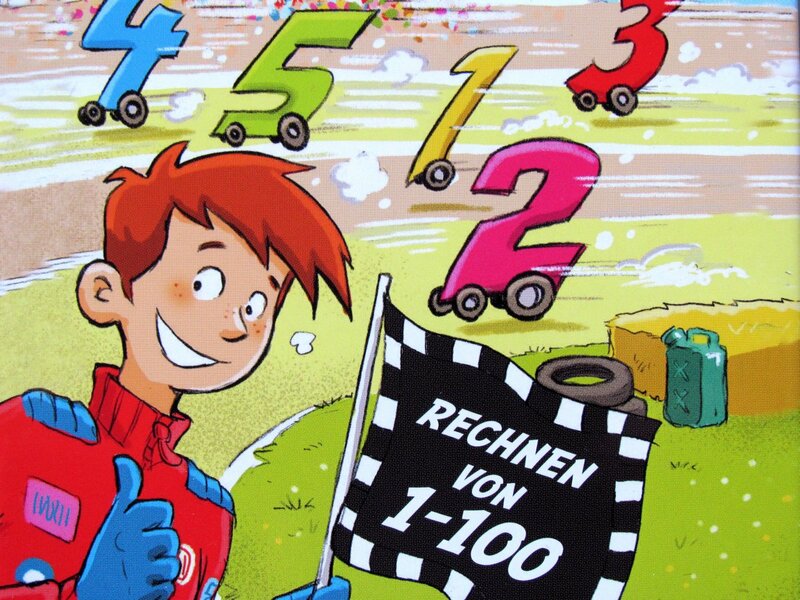 At the beginning, however, all participants can take a look and try to remember the positions of individual pictures. 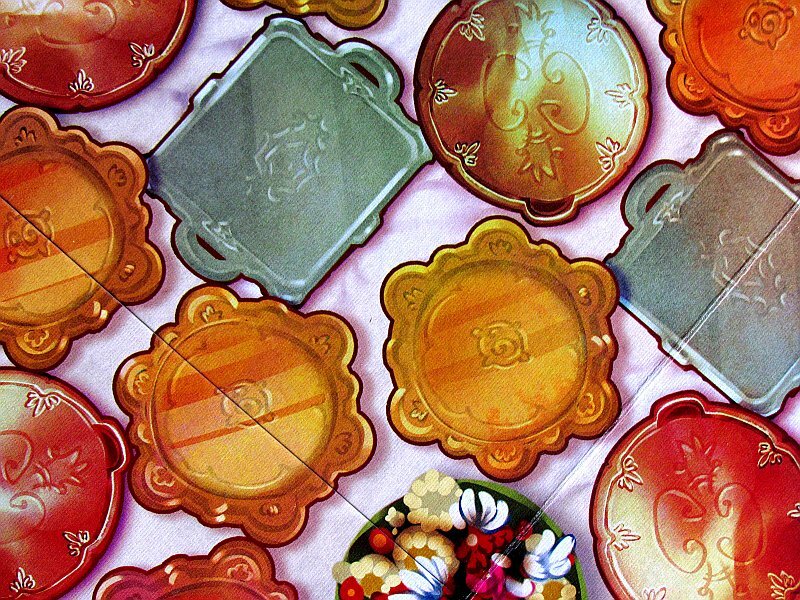 These are then evenly distributed along the perimeter of the royal dining table. 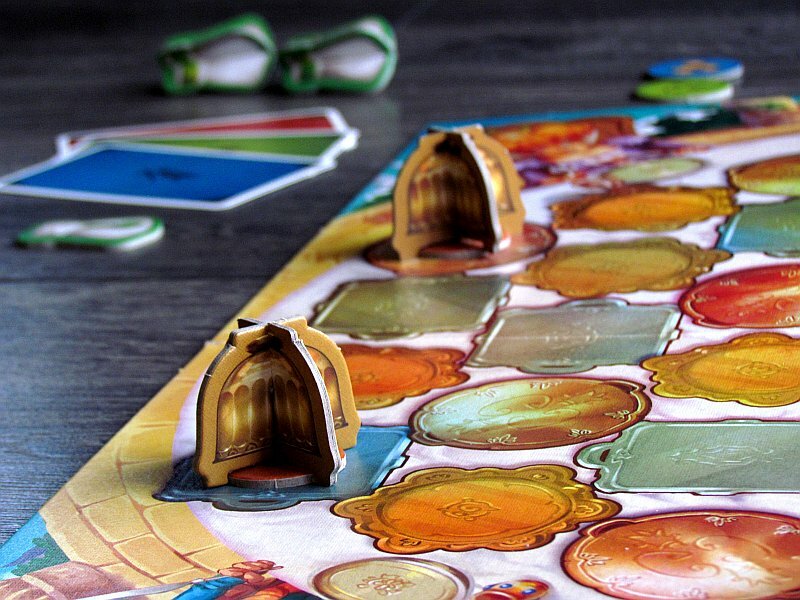 Each of the opponents performs the complete turn before passing the word in the next order. And his efforts consist of four phases. First you can choose any food in the kitchen and add it to the table in the dining room. The neighborhood rule must be always observed, so at the beginning, only one of the six fields around the bouquet in the center of the table can be placed in the kitchen. That’s exactly what the royal table is doing right now. 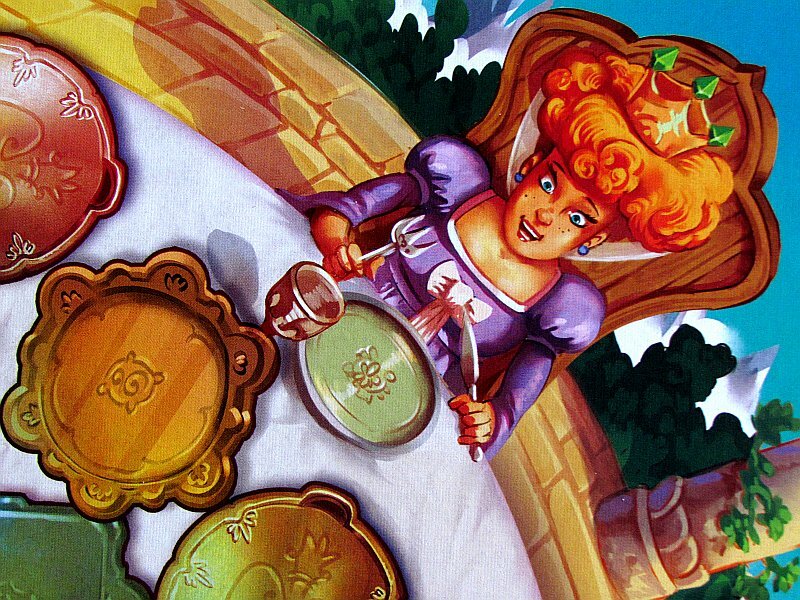 Instead of a meal, a player can also place one of his two game caps on the table. The third one will always lie in front of him as a reminder of color. 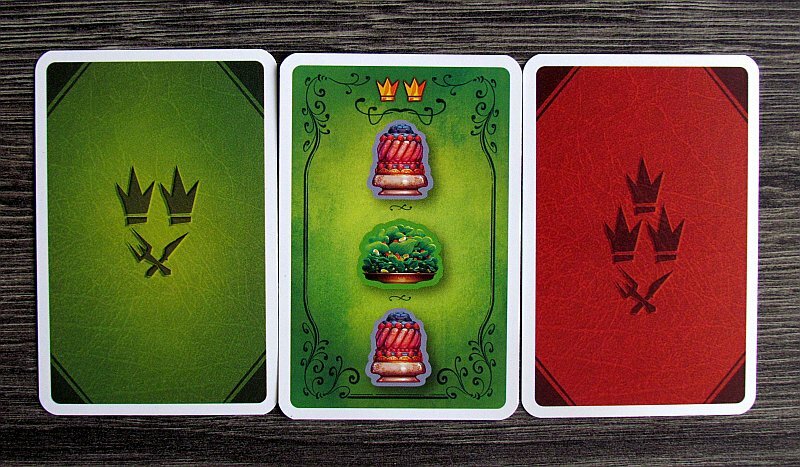 Once a new meal is placed on the table, a series of meals that correspond to an order on one of the cards in the player’s hand can be immediately picked up. Agreeing not only with the food itself but also with its order. Such a successful order will bring players that amount of points at the end of the game. The last two turn activities are optional. The player can drop one order card from his hand and then draw a new one from the same deck, ie the same value as the discarded card. Later in the game, there is another option. 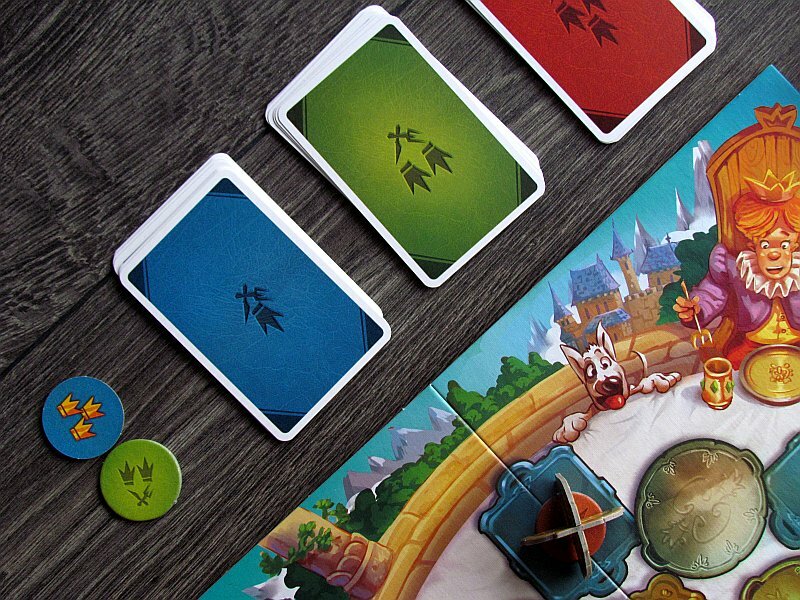 The player may announce royal order as the first action of his turn. This can only be done if the order piece on the perimeter of the table is connected with a bouquet in the center. 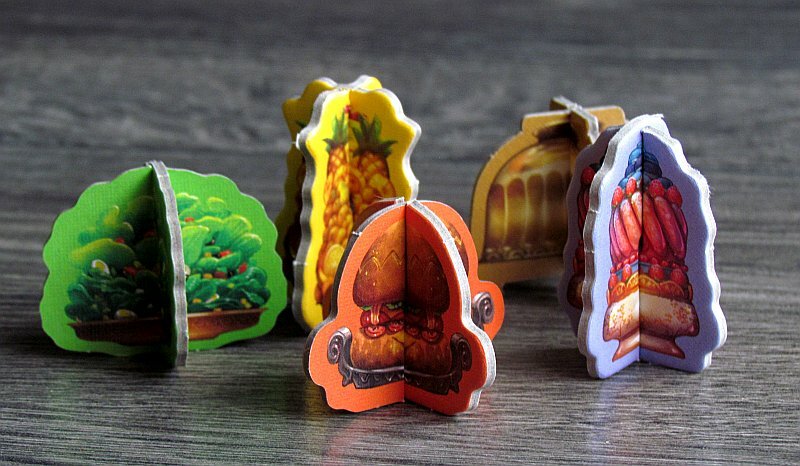 However, in order for the player to win the points from that token, he must correctly guess the food that is hidden on the chip. Game continues until the table is full. Now, the royal family can finally dig into food and the player’s get a decent rest. But only one of them deserves the real gratitude of the king, and it is the one, who has the highest point gain on his account in the sum of the completed orders and cards. Banquet Royal is an unobtrusive variation in the effort to combine three images in a line. 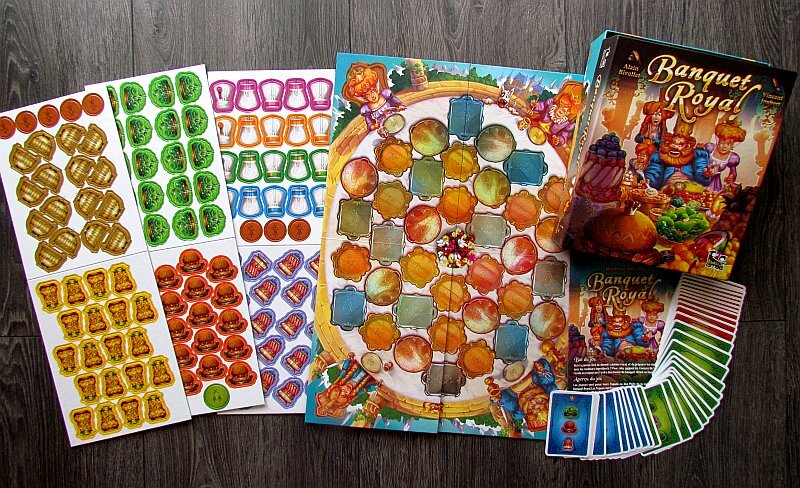 This time, however, players do not make a series of the same to explode and disappear (as in Potion Explosion), but they try to make order sets to gain points. However, all meals remain on the table and can be used for scoring again in the upcoming turns. 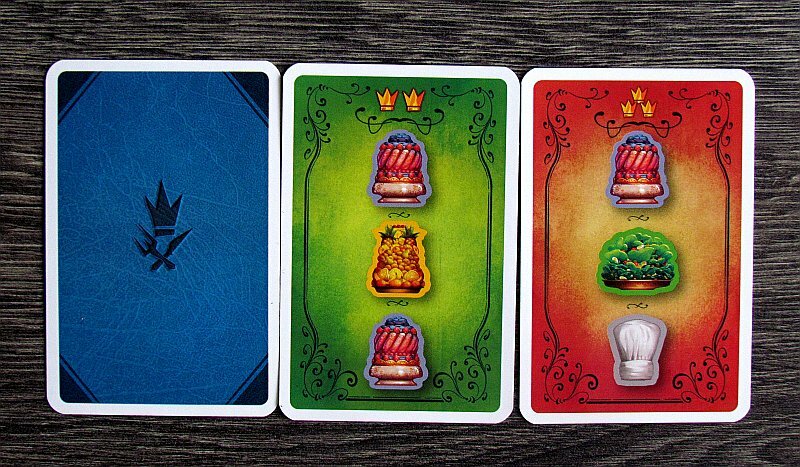 However, success depends largely on what order cards the player has at hand. 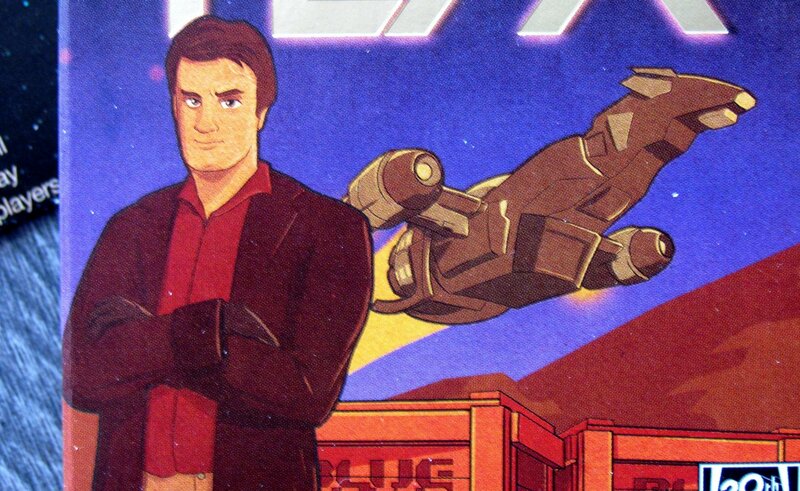 Especially at the beginning of the game, it determines the large number of points earned. Later on the table a lot of combinations and possibilities, so at the moment it depends more on observation and mindfulness player who easily his scoring chance may have overlooked. Match has clearly defined limits, so it can easily be completed around the indicated twenty minutes. With the growing number of opponents, of course, increases the chances that one of them will steal scoring chances, you were going for. The most fun battle takes place in two, but the game is also fun in higher numbers. Variants are also interesting. Even besides the one for gourmets, that provides new positional conditions. These options can be added by players at any time, as they serve only enrichment of the basic version. 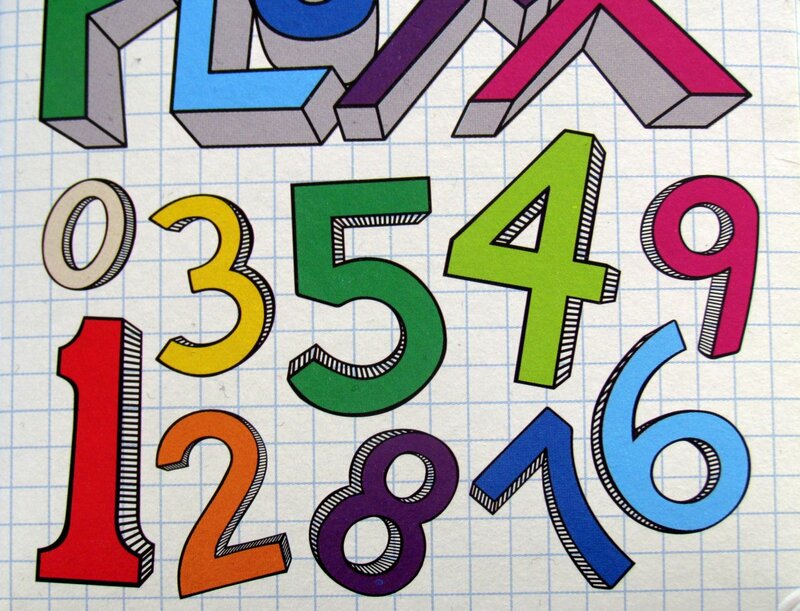 At the end of the rules, however, other variations are described, which bring further changes in scoring or setup. This improves variability of the game, which would otherwise work much similarly in every game. This stays probably our biggest complaint. The game is really undemanding, when it comes to rules. But what is most interesting for the target group is processing. 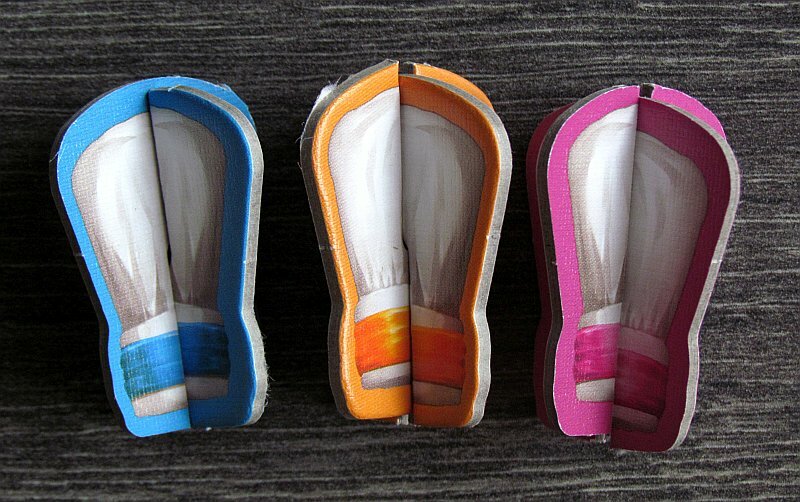 Lots of cardboard pieces that combine two parts to create an elegant spatial impression during the match. 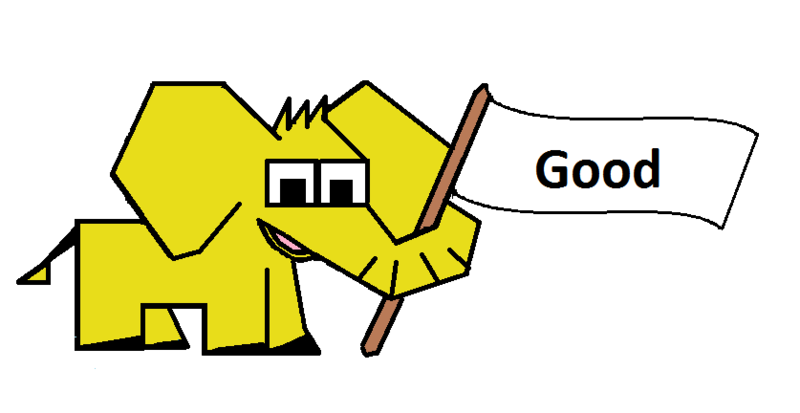 Together with colorful illustrations, game is pleasant to look at. 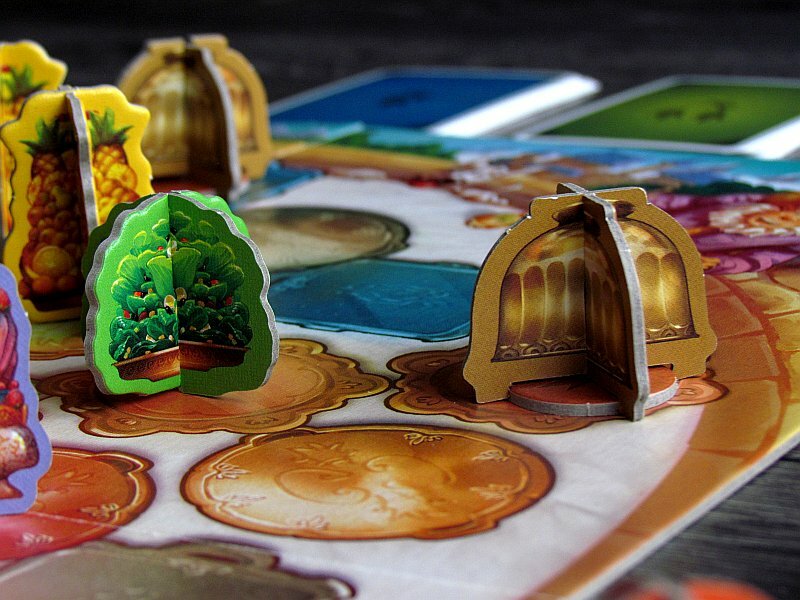 Banquet Royal is, thanks to the memory element, a board game focused on children. And they and even their parents will enjoy it best. 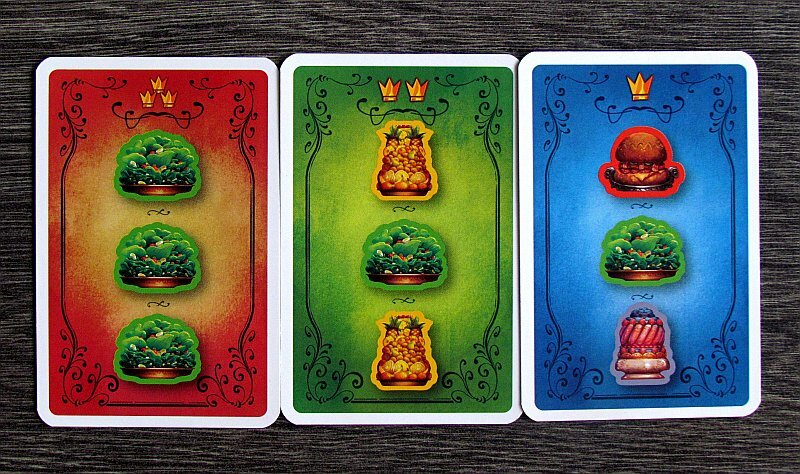 It is a nice tactical game, in which the coincidence affects the result only in part by drawing the cards. You can also throw them away, so its not that big deal. 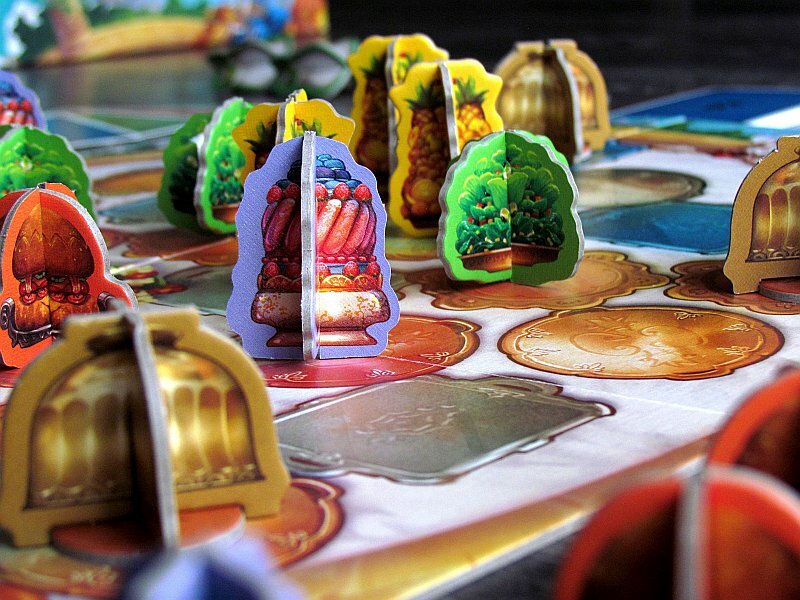 Overall, Banquet Royal is a nice and colorful family game. Banquet Royal is a family board game, in which you try to feed the royal family. 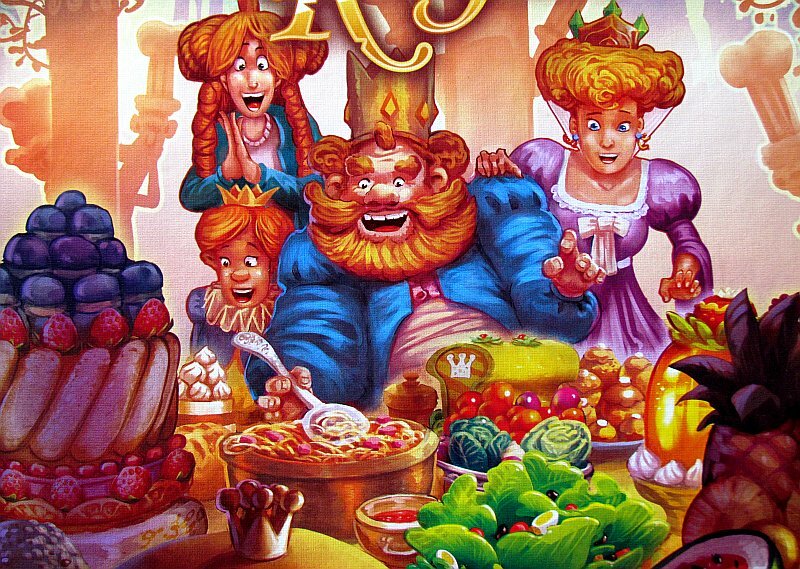 Players gradually fill up the huge dining table and try to make orders from their masters. They have to create a series of meals next to each other, collecting points for it. The additional variants of the game move a little further and offer improvements in otherwise a little weaker redeemability. 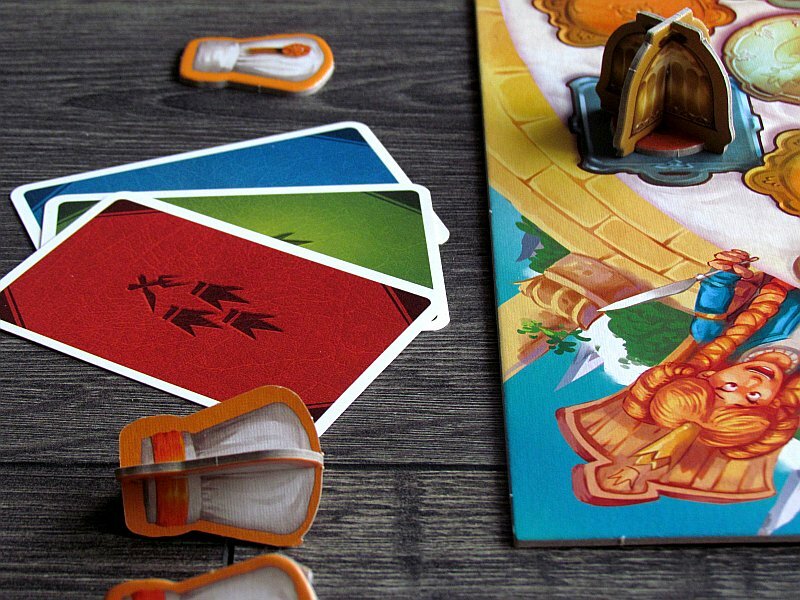 But if we take into account the fact, that the game is primarily intended for children from seventh year, then Banquet Royal is a very good and fun thing to do.